One of the highlights of mayoral inauguration on Monday, which receieved a standing ovation from the crowd in Heinz Hall and has been shared on Twitter was the poem by Pittsburgh artist Vanessa German. Vanessa has a long history of advocating for Pittsburgh and the neighborhoods of Pittsburgh. She is also the force behind the “Stop Shooting We Love You” yard signs that you may have seen around the city. These signs are part of the Love Front Porch. One day when, taking a break on the porch from my sculptures, I heard a round of 21 gunshots. I waited. I grieved. I worried for my neighbors, my students, the victims, the shooters, their families. I noticed the signs for political candidates in the yards around me and I thought maybe I could do something. Out on the porch, I began printing yard signs that encouraged peace and nonviolence with messages like “Stop Shooting: We Love You” and “No Guns: Keep Summer Fun.” I began distributing them around the neighborhood to friends and community members who, like me, saw this as an opportunity to say “STOP!”, not with judgment, but with love. 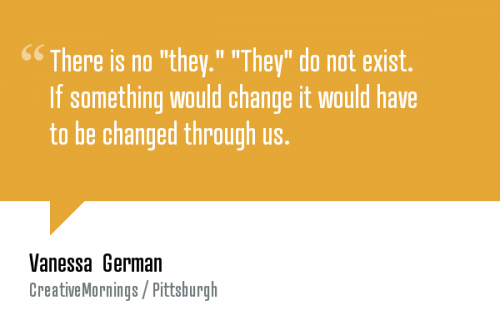 In November 2013 Vanessa German was the speaker at Creative Mornings Pittsburgh. Creative Mornings is a monthly talk that was started by Tina Roth Eisenberg, who is a designer based in New York. There are now Creative Mornings talks held each month in cities around the globe. Vanessa’s message has spread way beyond Pittsburgh. Tina Roth Eisenberg is also the author of the popular design blog, Swiss Miss. Last month Vanessa’s Creative Mornings talk was featured on Swiss Miss. « Are you registered to vote?